Orion's UV-450 Crystal Lite sunglasses deliver performance at a good price. When you live in Florida, sunglasses are part of your daily wardrobe. Our sun is serious and our sunglasses need to be serious as well. Look around the marketplace and you’ll see sunglasses for $100 or more and in many cases, $200 or more. We want great sunglasses, something that won’t break the bank, something us working stiffs can afford. What ever happened to a great pair of sunglasses for $50? We found ’em at the PGA Merchandise Show, and the man behind the product is Kevin “Orion” McDaniel, a golfer, swimmer, mountain-biker, all-around outoor kinda guy based up there in the “Redneck Riviera” otherwise known as Panama City Beach, Florida. His company is TRENDZ and his products are Orion Sunglasses. We picked up a pair for 50 bucks and decided to give them a try. Put my Oakleys into the drawer and on went the Orion UV-450 Crystal Lites. The first thing you notice is yes, they are extraordinary lite with a frame you can bend and not break. Second thing you notice is the great visibility and they work for any activity. Great on the golf course, even greater when you’re cruising Florida highways in a sporty convertible. Great protection, and again, great visibility. The Lites come in an assortment of frames, the tortoise shell really looks great. 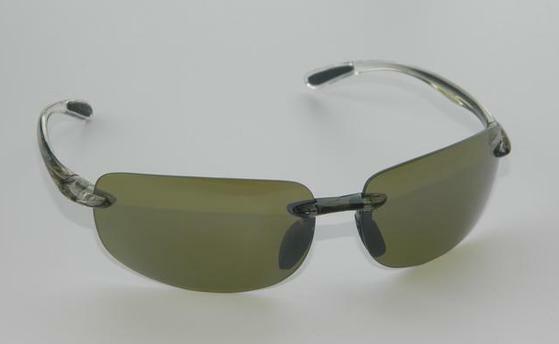 They also come in different frame styles — blade frames and edge frames. Although we haven’t tried those, they look great and if they are anything like the Lites, they’re winners. Yes, what the world needs is a good, high-quality pair of sunglasses for $50 and these do live up to the “high performance” billing.